The polyhphenols present in apples help to reduce the fluctuations of blood sugar, which is particularly important for people suffering from diabetes. Pair this with the benefits of consuming acetic acid, present in vinegar and we’re definitely on for a winner. Apples are also rich in iron and can be used to help treat anaemia, however, I always find that the season isn’t long enough, especially for the number of apples we produce at the restaurant. Pickled apples are usually on the menu for the rest of the year when there aren’t any in season. Meanwhile, add the vinegar & sugar to a saucepan and place on a gentle heat. 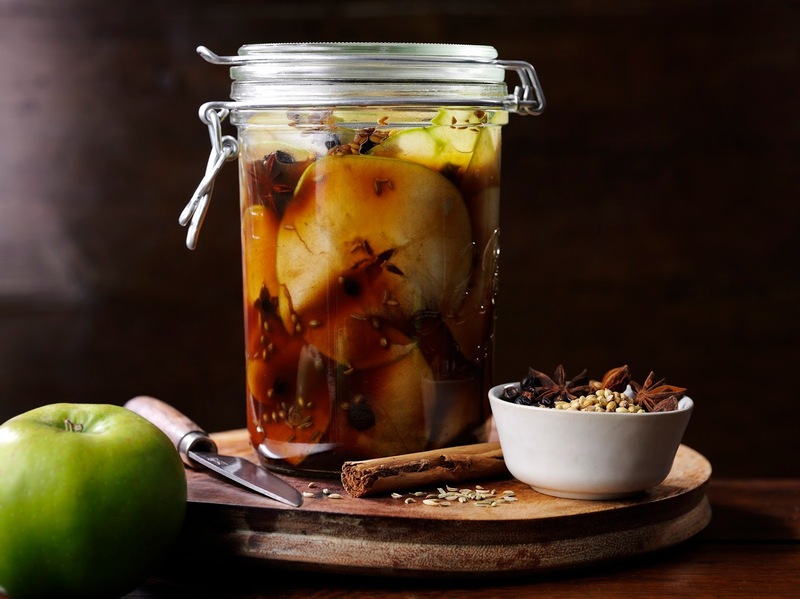 What do you think of this Pickled Apple recipe? You might also like this recipe: Beetroot And Lovage Pickled Eggs. "Banana and Chocolate Warming Oat Smoothie…"
"Exotic Christmas Yule Log: Christmas Party Recipes"